The Star Education Fund was initiated in 1994 with the primary aim of providing educational opportunities to deserving and needy young Malaysians. 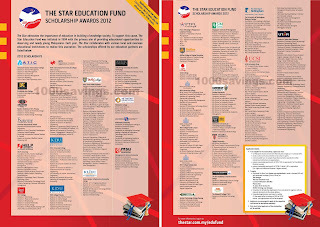 Each year, The Star Collaborates with various local and overseas educational institutions to realise this aspiration. be Malaysian citizens of not more than 25 years of age as at 1st January 2012.
for the Higher and Advanced Diploma / Degree courses, applicants must possess reasonably good results in the STPM / A-Level / UEC or equivalent. 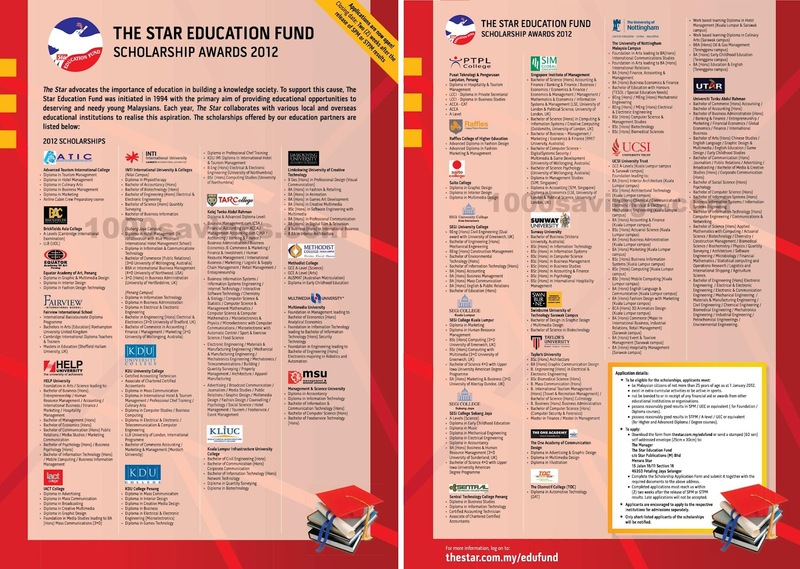 Applications are now open to Malaysians for scholarship awards offered by educational institutions listed at The Star Education Fund page. Completed application forms with the required certified supporting documents listed in the application forms must be received by (2) two weeks after the release of SPM or STPM results. Late applications will not be accepted. p/s : Remember to share this page with your family members / relatives / friends who are waiting for SPM / STPM results! Check out also Education USA Fairs 2012 by MACEE at Kuala Lumpur (31 Mar) and Penang (3 Apr).